On sale! 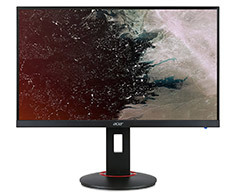 (normally $399) The Acer XF Series gaming monitor combines a Full HD (1920x1080) resolution, AMD FreeSync, a 144Hz refresh rate and a 1ms response time, to give you the gaming experience you deserve. The Acer XF270HB comes with an ergonomically designed stand, featuring tilt and height adjustment. It offers HDMI and DisplayPort connectivity with VESA mounting support.